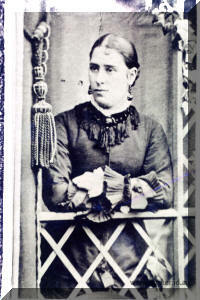 Louisa Cocker was born on 8 Nov 1853 in Launceston and was christened on 15 Dec 1853 in Patterson Street Church, Launceston. 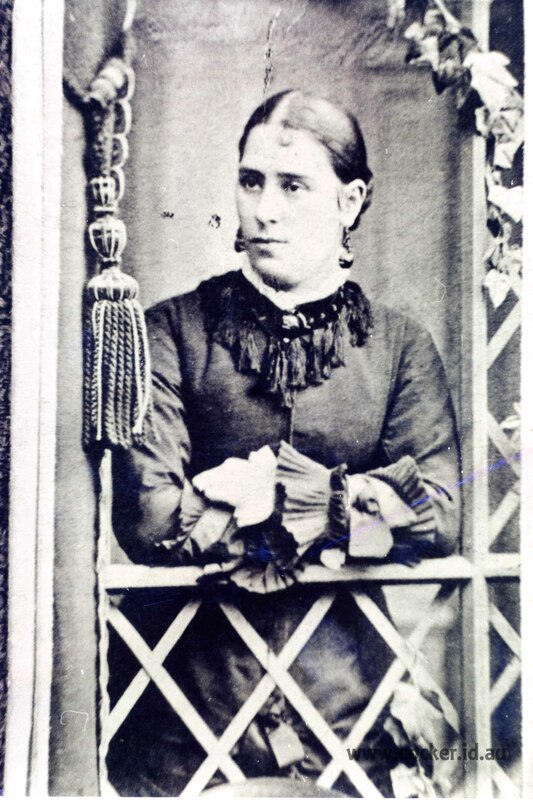 Louisa married Thomas Rutter, on 11 Apr 1872 in Wesleyan Parsonage District of Port Sorell [Latrobe], Tasmania. Thomas was born in England in 1847 and died on 3 Mar 1917 in Lower Barrington, Tasmania at age 70. 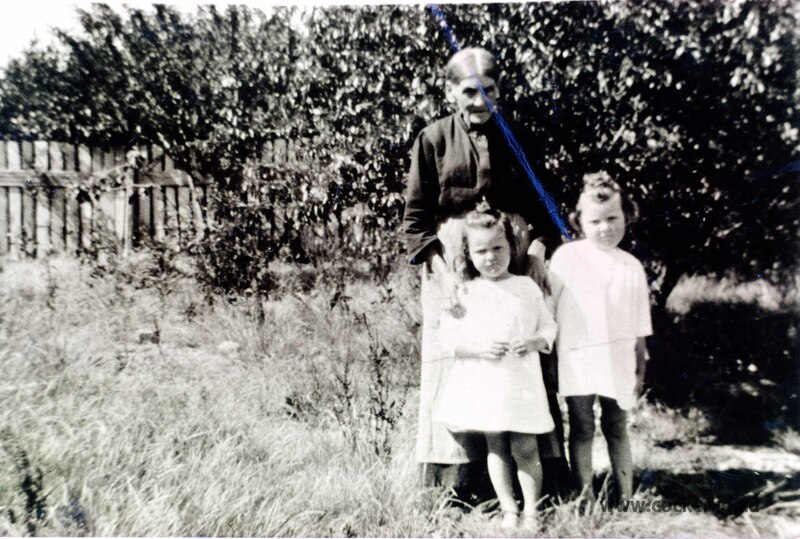 Louisa is pictured above, and right with two unknown children. Can you identify them? 3-Alice Sarah Rutter was born on 10 Oct 1872 in Port Sorell, died on 27 Dec 1951 in 6 Appledore Street, Devonport, Tasmania at age 79, and was buried in Devonport General Cemetery. Alice married George Cole, son of Henry Cole and Julia Synott on 1 Apr 1900 in Don, Tasmania. George was born on 28 Aug 1869 in Port Sorell and died on 18 Apr 1953. They had eight children: Dorothea Louisa Adeline, Essie Aileen Alice, Alice Elvina, George Ronald, George Ronald, Caroline, Melvina Mary and Thomas Henry. 4-Dorothea Louisa Adeline Cole was born on 11 Mar 1901 in Don, Tasmania. Dorothea married Reg Smith. They had two children: Barbara and Margaret. 4-Essie Aileen Alice Cole was born on 17 Sep 1903. Essie married Turner. They had two children: Moyera and Catherin. 4-Alice Elvina Cole was born on 27 Feb 1905 in Don, Tasmania. Alice married Plugger Hortle. They had one daughter: Marie. 4-George Ronald Cole was born on 21 Jan 1907 in Don, Tasmania and died on 7 Feb 1907. 4-George Ronald Cole was born on 9 Feb 1908 in Don, Tasmania. George married Kath. They had five children: Barry, Jill, Judith, Ronald and Michael. 4-Caroline Cole was born on 2 Oct 1909 in Don, Tasmania. Caroline married Tom Hammersley. 4-Melvina Mary Cole was born on 18 Aug 1911 in Don, Tasmania. 4-Thomas Henry Cole was born on 12 Apr 1913 in Don, Tasmania. 3-Thomas Samuel Rutter was born on 2 May 1874 in Port Sorell. Thomas married Vivian May. 3-Alfred John Rutter was born on 25 Sep 1876 in Port Sorell and died on 11 Jul 1904 in Irish Town at age 27. 3-Arthur Wellesley Rutter was born on 18 Jun 1878 in Port Sorell. 3-Walter Leonard Rutter† was born on 27 Sep 1880 in Port Sorell and died on 19 Aug 1916 on Active Service in World War 1at age 35. He lived in New Zealand for several years but returned to Tasmania when war broke out and volunteered here. Private No. 5170, 12th Battalion AIF, he embarked at Melbourne on 29 Mar 1916 on board RMS Orontes with the 12th Infantry Battalion. He was killed in action on 19 August 1916 at Mouquet Farm when he was hit by a shell and buried where he fell. He is commemorated on the Villers-Bretonneux Memorial, Villers-Bretonneux, Picardie, France. The Launceston Daily Telegraph of 5 Jul 1906 reported on page 7 on the Barrington versus Sheffield game and noted that he undoubtedly played the best game on the ground. General satisfaction was expressed when it became known that the prominent footballer Walter Rutter had been selected as one to represent Tasmania in their engagements with teams on the mainland during the visit of the American fleet. As Rutter is a favorite here and elsewhere, his career will be watched with interest. Lower Barrington news was received on Saturday of the death of Walter Rutter who was well known on the coast as a musician and sportsman. As a footballer he was prominent as a member of the North v South teams and also a member of the Tasmanian interstate team on the mainland. BARRINGTON. A concert was held in the Methodist Church on Thursday evening to benefit the wife and family of the late Pte. Walter Rutter who was killed in action in France. Mr. J. Nevin loaned his piano for the occasion. The Warden (Cr. Moore.) occupied the chair. The programme was as follows: Instrumental duets, Misses R. Ratcliffe and Rockliff and Robertson and Bye: songs, Miss Ratcliff. Mr. V. Robertson and Mr. M. M'cInnes: recitations. Mrs. D. Russell and Miss M. Habrer and I. Rattciff: violin and R. Robertson: song, school children.The National Anthem was sung after which supper was handed round. The proceeds were £5. Walter married Nellie Amelda O'Donnell in 1913 in New Zealand. They had five children: Renne, Dawn, Moreen, Walter John (Watty) and Leonard Thomas. 4-Renne Rutter was born in New Zealand. 4-Dawn Rutter was born in New Zealand. Dawn married Ivan. They had three children: Chris, Mark and Kym. 4-Moreen Rutter was born in 1914 in New Zealand. 4-Walter John (Watty) Rutter was born on 24 Aug 1916 in Don, Tasmania. Walter married Biddy. 4-Leonard Thomas Rutter was born on 24 Aug 1916 in Don, Tasmania. Leonard married Lorna Mills. They had one daughter: Dianne. 3-Herbert William Rutter was born on 24 Feb 1883 in Port Sorell. 3-Ada Adeline Rutter was born on 11 Nov 1884 in Port Sorell, died on 2 Oct 1967 in Devonport at age 82, and was buried in 1967 in Devonport. Ada married her first cousin Hedley Mansley (Ted) Bennett, son of Thomas Bennett and Sarah Cocker, on 15 Apr 1908 in Barrington, Tasmania. Hedley was born on 22 Apr 1880 in Port Sorell, died on 13 Feb 1964 in Mersey Hospital Latrobe at age 83, and was buried in 1964 in Devonport. They had one daughter: Audrey Elaine. 4-Audrey Elaine Bennett was born on 22 Jul 1929 in Barrington, Tasmania. Audrey married Alan Jamieson on 27 Dec 1954 in Methodist Church Devonport. They had two children: Ian Ronald and Kevin Peter. 5-Ian Ronald Jamieson was born on 5 Oct 1952 in Latrobe. Ian married Christine (Chrissy) Louise Bassett. Christine was born on 10 Jul 1953. They had one daughter: Fabienne Bronte. 6-Fabienne Bronte Jamieson was born on 15 Jul 1989 in Burnie, Tasmania, Australia. 5-Kevin Peter Jamieson was born on 12 Feb 1955 in Latrobe. Kevin married Anthea Course, daughter of Unknown and Unknown, on 10 Nov 1983. Anthea was born on 24 Dec 1958 in Victoria. They had six children: Skye Elizabeth, Mark Ian, Mistie, Daniel Stephen, Narelle and Andrea. 6-Skye Elizabeth Jamieson was born on 18 Aug 1981 in Victoria. 6-Mark Ian Jamieson was born on 4 May 1984 in Victoria. 6-Mistie Jamieson was born in Dec 1984. 6-Daniel Stephen Jamieson was born on 11 Jan 1985 in Devonport. 6-Narelle Jamieson was christened on 11 Aug 1986. 6-Andrea Jamieson was born on 11 Aug 1986. 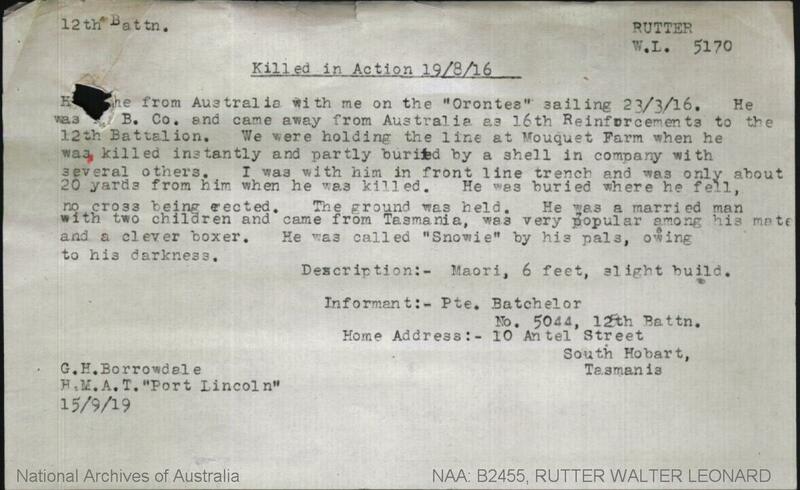 3-Ernest James Rutter was born on 6 Dec 1886 in Port Sorell and died in Smithton. Ernest married Alice Emelia Scanlan on 29 Jul 1925 in Railton, Tasmania, Australia. Alice died in Railton, Tasmania, Australia. They had three children: William (Bill), Geoff Michael and Albert John (Jack). 4-Geoff Michael Rutter was born on 28 Aug 1928 and died on 2 Jan 2000 in Wynyard, Tasmania at age 71. Geoff married Clorine Parker on 25 Jul 1964. Clorine was born on 6 Feb 1926 in Latrobe and died in 1993 at age 67. They had two children: Michael John and Janet. 5-Michael John Rutter was born on 12 Dec 1960 in Devonport. Michael married Andrea Joy Ohalloran on 18 May 1985 in St. Bridgets Roman Catholic Church, Wynyard. Andrea was born on 7 Dec 1961 in Wynyard, Tasmania. They had three children: James Edward, Vincent Michael and Hobie William. 6-James Edward Rutter was born on 7 Dec 1986 in Burnie, Tasmania, Australia. 6-Vincent Michael Rutter was born on 9 Apr 1990 in Burnie, Tasmania, Australia and died on 29 Mar 1991 in Burnie, Tasmania, Australia. 6-Hobie William Rutter was born on 23 Jan 1993 in Burnie, Tasmania, Australia. 5-Janet Rutter was born on 11 Sep 1962 in Devonport. Janet married David Scolyer on 2 May 1981. David was born on 26 Jul 1961 in Wynyard, Tasmania. 4-Albert John (Jack) Rutter died on 2 Feb 1996 in Smithton. 3-Louise Jane Rutter was born on 21 Oct 1889 in Port Frederick and died on 2 Nov 1978 in Devonport at age 89. Louise married James Herbert Rosevear, son of Thomas Rosevear and Fanny Thomson, on 31 Oct 1917 in St Pauls, East. James was born on 19 Dec 1876 in Launceston. They had three children: Jean Louise, Faye and Pauline. 4-Jean Louise Rosevear was born in 1920 and died on 1 Oct 1975 at age 55. Jean married David Bramich, son of Ernest Aubrey Bramich and Violet May Jeffrey. They had one son: James. 4-Faye Rosevear. Faye married Jack Flint. They had one son: John. 3-Louis Royal Rutter was born on 28 May 1892 in Sheffield and died in 1901 at age 9. 3-Joseph Charles (Chas) Pickering Rutter was born on 17 Oct 1894 in Sheffield. Jospeh served in World War 1 as a Sergeant in the 40th Battalion. Machine Gun Section. His unit embarked from Hobart, Tasmania, on board HMAT A35 Berrima on 1 July 1916 and he returned to Australia on 23 Jul 1919.